Here’s some advice from younger Republicans for improving the party’s fortunes in national elections: Nominate more minority and female candidates. Among Republicans and leaners under 40, 68% say nominating more racial and ethnic minorities would help and 64% say the same about more women nominees. Far fewer Republicans 40 and older view these steps as helpful: 49% say nominating more racial and ethnic minorities would help and 46% say the same of nominating more women. More generally, younger Republicans are more likely than older Republicans to say that the GOP has not been welcoming to all groups of people. Overall, most Republicans (60%) think the party “is tolerant and open to all groups of people,” while 36% say it is not. Younger Republicans are divided – 51% say the party is tolerant and open to all, while 45% disagreed. Among older Republicans, twice as many view the party as tolerant (64%) than not (32%). Based on surveys conducted over the past year, one-third of all Republicans and GOP leaners are under age 40. Those in the younger group are less likely to call themselves Republicans – 59% are Republicans while 41% simply lean toward the GOP – than those in the older group (65% Republicans vs. 35% leaners). Also, fewer younger Republicans and leaners describe their political views as conservative (54% vs. 67% of older Republicans) and fewer agree with the Tea Party (26% vs. 43%). Despite these ideological differences, younger and older Republicans generally agree that the GOP needs to address major problems – rather than just make minor changes – in order to be competitive in the future. And there are no significant age differences over the party’s future ideological direction: 50% of Republicans under 40 and 55% of those 40 and older favor their leaders moving in a more conservative direction. 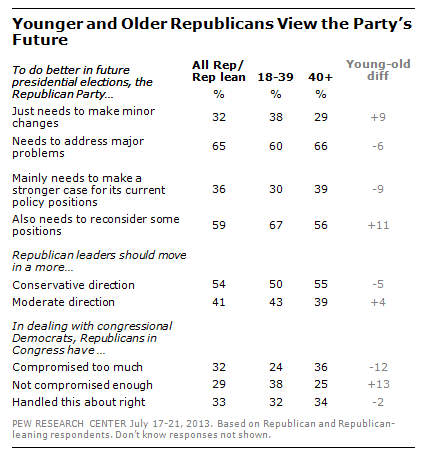 However, younger Republicans have a different outlook about congressional compromise. Nearly four-in-ten (38%) said the GOP hasn’t compromised enough with Democrats in Congress, compared with 25% of older Republicans. About a quarter (24%) of younger Republicans believe the party has compromised too much, compared to 36% of Republicans 40 and older. About one-third of each group say the party has handled this about right. Meredith Dost is a research assistant focusing on U.S. politics and policy at Pew Research Center.